This website is the home to Miami's growing hooping community. Hula hooping has transcended from a children's toy to a fun and addictive fitness alternative for ALL AGES! "Your body is a machine. Keep those gears hooping." There is no feeling of monotony in hoop-dance, because hooping practices the art of "flow". The state of flow one experiences in hooping is not only an excellent form of art or fitness; The art of "flow" helps you tap into your body's creative movements, and helps alleviate stress and anxiety. Hooping is not gender specific, and does not discriminate against age. If you live in the Miami area and are interested in learning more about hooping and the art of hoop-dance then please click on "Join Us". We have monthly events going on throughout our city, and we are just getting started! Check out our "BLOG" for news & inspiring stories. Beginners and novices are extremely WELCOME to join us! Do not be shy! Do keep in mind, that we do not use regular toy hoops found in toy stores! Check out our "Wanna Buy a Hoop?" 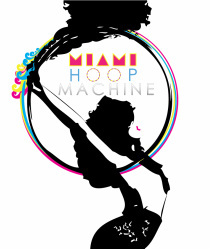 page for crafty & talented, local Miami hoop makers! !